Round K, a Korean dah-bahn-inspired café that has been a hit in New York City for its Instagram-inspiring drinks and ambitious coffee program, has opened an L.A. location in Mid-Wilshire. The menu includes some options you won’t find at most coffee joints around town. There’s a wasabi latte for those who like a little spice, and an egg cappuccino, one of the most popular items, which features a raw egg yolk whisked into hot espresso, topped with frothed cream and bitter cocoa. Food options include a dish named Mrs. Lee’s Breakfast, which has espresso-steamed eggs served on a croissant with kimchi and bacon. 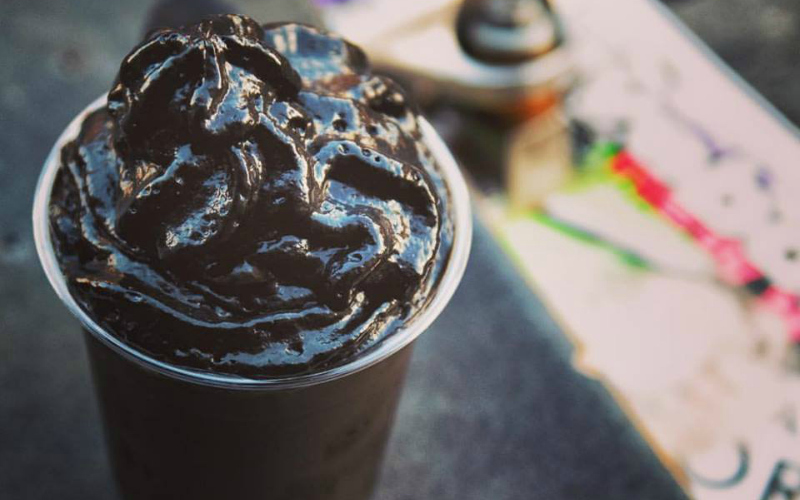 For the “goth ice cream” lovers who still can’t get enough of black food items, there’s the Matte Black Latte. Unlike many grey and black foods we’ve seen as this trend has marched across the city, this latte does not rely on activated charcoal to get its deep color. Instead, the baristas use an organic coconut ash, which is even blacker. This video by Epoch Taste, filmed at the New York City location, shows the process that goes into the signature drink, which is, as you may have noticed, actually rather shiny, not matte, but is certainly a very opaque black. And while it’s the more novel items that will attract the social media crowd, it’s worth noting that the cafe’s founder, Ochyeon Byeon, really loves coffee for what it is, and operates a micro-roasting operation that focuses on high-end beans. Earlier this year, he created what he named Astronaut Coffee, a brew that retails for $50 a cup in the NYC shop. To create it, he hand-sourced raw beans from a single farm in Columbia, and then sent the beans up into the mesosphere over New Jersey using a scientific-grade weather balloon. He recovered the beans and tested how the atmospheric conditions has changed them, then roasted them to bring out those special properties.